eMG1 and eMG – the new generation of EagleBurgmann pump seals. These can be used to seal, among other things, chemical pumps, water and waste water pumps, circulating pumps and submersible motor pumps in numerous industrial sectors. The eMG1 is 100% compatible with the well-known MG1 standard seal. EagleBurgmann says it has been innovated in detail and functionally expanded. A vastly reduced outer diameter of the bellows support now allows direct support by a retaining ring or with the use of much smaller spacer rings. The optimized bellows shape improves the automatic alignment of the bellows on the shaft and minimizes stick-slip effects. 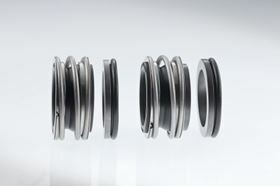 EagleBurgmann says the profiled PEEK-PTFE disk ensures consistent centering across the entire pressure operating range, exhibits good sliding properties and safeguards the automatic alignment of the elastomer bellows in operation through continuous self-cleaning. The eMG is identical in construction with the eMG1, but has a 20% shorter installation length. This provides manufacturers with new opportunities in pump construction: e.g., a more compact design due to shorter shafts with the associated material savings and increased efficiency. EagleBurgmann says the rotating unit is space-saving. The computed pre-modelled bellows design and the spring assembly have no excess lengths and the outer diameter of the bellows support was reduced to a minimum.